To wean America off polluting and politically unstable foreign oil, government members and legislators are advocating technologies such as solar, wind, geothermal and also wave energy to develop new sources of power. President Obama is pushing for green jobs and Americans want them. Inspired by children playing with a beach ball at the seaside, Shlomo Gilboa an Israeli politician-turned-inventor has invested millions of his own dollars in Seanergy, a new company and product that share a name. 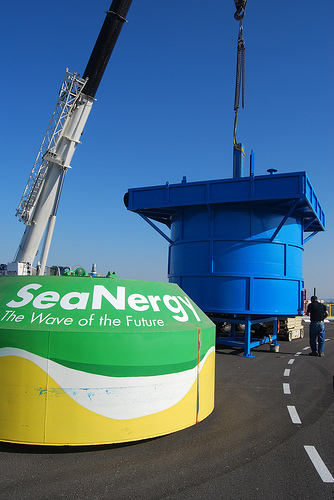 Seanergy harvests the energy of ocean waves through an offshore farm of buoys. It could be the next technology adopted by American utility companies, if Gilboa has his way. In an interview with ISRAEL21c, Gilboa relates that the technology now being tested off the coast of Haifa can harness 20 times more power from wave energy than any other similar technology in existence today. Seanergy is currently working with the Israel Electric Corporation and has been endorsed by engineers at the University of Haifa. Gilboa says that while generating electric power, the system also produces a significant amount of carbon-free desalinated water. He estimates that a million cubic meters of desalinated water will be produced by a Seanergy farm that covers a 300 square meter (about 3,229 square foot) patch of water at sea. While traditional desalination plants can produce orders of magnitudes more water, unlike Seanergy they require an extensive amount of energy input to the system. Currently a number of large and small companies around the world are negotiating with the company about a first facility, which will require a $2 million investment for four, four-buoy clusters. Gilboa says that according to the most conservative projection, the Seanergy buoy system, which sits below the surface of the waves and pops up as it collects energy, can pay for itself in feed-in tariffs within three years. To illustrate his point, Gilboa describes the Seanergy cluster in a region off the coast of Oregon in the US. Each buoy there can generate 1 megawatt of power, which over a year amounts to 200 to 250 kilowatts per cluster. According to the Cnet tech journal, that’s enough to power about 80 homes. The amount generated at any given site is a function of the wave action potential there. Companies all over the world are attempting to capture the power of waves and there are a plethora of what appear to be zoologically-inspired prototypes that range from the bizarre to the sublime. There are massive ‘snakes’ (655-foot-long anaconda devices), ‘oysters’ (large hydraulic flaps that open and close) and ‘dragons’ (contraptions with long arm-like devices that direct waves up a ramp toward an offshore reservoir). The weird-looking snakes move hypnotically through the waves. Seanergy presented its prototype at the “Innovation” pavilion in the Industry, Trade and Labor Ministry’s NEWTech division for the estimated 19,000 people who attended the international Watec conference in Tel Aviv in November. NEWTech promotes Israeli water technologies worldwide. At the Haifa National Museum of Science Seanergy is presented as an important and radical new green technology. In the near future, you may see its buoys bouncing around a coast near you.